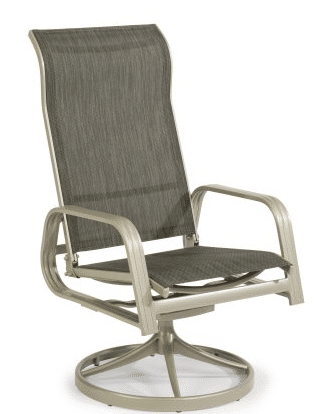 In this article we will discuss the sling version of the outdoor swivel rocking chairs. The two styles of Home Styles chairs in this review will be the Daytona and South Beach. These type of chairs can be used in many areas in your outdoor space and can be purchased one at a time. I purchase very similar chairs for my front porch several years ago and they still look like new. The big difference of these two chairs is their finished color, the Daytona is a charcoal and the South Beach is grey, every thing else is the same. They will swivel and have a rocking motion that is produced by a bracket that has steel bars for springs. Now let me show you the details of these chairs and see if one will work for you. 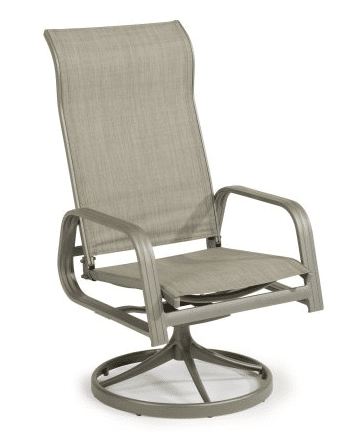 Each of your outdoor swivel rocking chairs will be 23.75 inches wide, 28.5 inches deep and 43 inches tall. The seat will be about 18.5 inches square and 18 inches off the ground. The fabric is a vinyl coated polyester fabric, that most refer to as a sling material, it last very well in outdoor conditions. I have several chairs with this material and they have been outside for over 5 years with no sign of wear or tear. Frames are made from aluminum with a powder coated finish. The swivel bracket is made from steel. Swivel motion will include 360 degrees if you have space. The rocking motion is supplied by the bars in the bracket, it is not a full rocking motion, just gentle movement. You will get a chair that will need a little assembly. The main frame has a mildew resistant sling in a neutral color. The sling is replaceable if damaged. The sling is made to allow air to circulate in the summer to keep your backside cool. When you open your 30 pound box of one of your outdoor swivel rocking chairs, look for the hard ware pack. This will include all tools and hardware to assemble your chair. Do not use power tools to tighten the screws as this can damage the threads. Use only supplied tools. In this style of chair you will have to attach the back and seat to one arm, then attach the other arm to this assembly. The swivel connector will attach to the seat bottom. Slide the swivel connector into the base section and put in the bolt in the bottom. Your chair should be ready to use. The biggest assembly issues with this style of chair is the frame bending while in the box and the screw holes not aligning. A gentle bend may be needed to align some holes. Like any fine piece of furniture these chair need some care to keep them looking new. A simple soap and water solution can be applied to the surface and the rinsed off with water from a hose. The sling material will dry very quickly so that you can go back to relaxing in your chair. 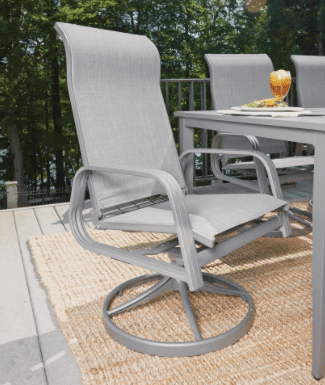 If you are looking for chair to relax by the pool, on the front porch, outdoor patio area or at a dining table, these outdoor swivel rocking chairs are a good choice. Once past the assembly, these chairs can be enjoyed in any area with little or no upkeep. If you damage your slings, they can be replaced. This style of chair also comes in regular chairs and some table and chair sets. Having a matching set in your outdoor room will come easy with this style of chair. 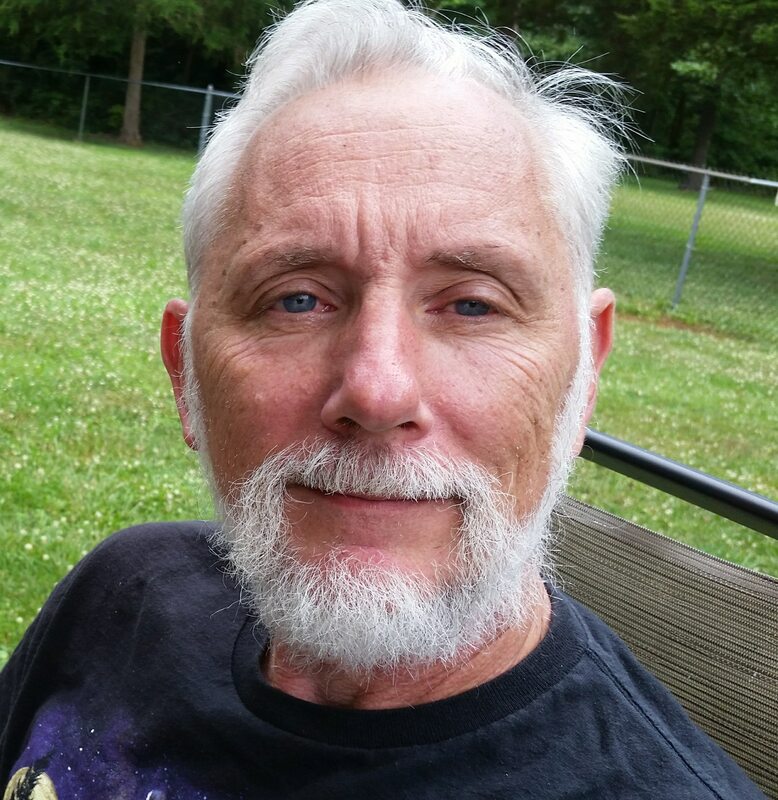 Thanks for this review on outdoor swivel rocking chairs. This post gave me the information I was looking to find about them. This is something for several areas in your outdoor living areas. Hi John, all of these look great and just in time for my favorite time of the year when it’s not too hot to sit out in the sun. Now I just have to decide on which one! They are great for any sitting area. Get a couple and a small table and you are ready for drinks and snacks. I really like this style of chair. Do they come in more than just the two different tones of grey? Been thinking about an outdoor room of my own. This style only comes in these two colors. Other colors are available, you just have to purchase sets of furniture to get them. Great review, John. I bought the first chair and I love it. I added some cushions that I made and occasionally I put my feet up! It is good and sturdy, well, at my weight. Thanks for sharing. These are great chairs that you can purchase one at a time. Most chairs of this type come in pairs or with a set. I have used mine for over 8 years, just store them in the winter and they will last for a lot of years.